This aim of this Analytical Match Report is to enhance the analysis of Rangers performance by providing a variety of advanced stats from the game. Explanations of these stats can be found in our tutorial for these reports. 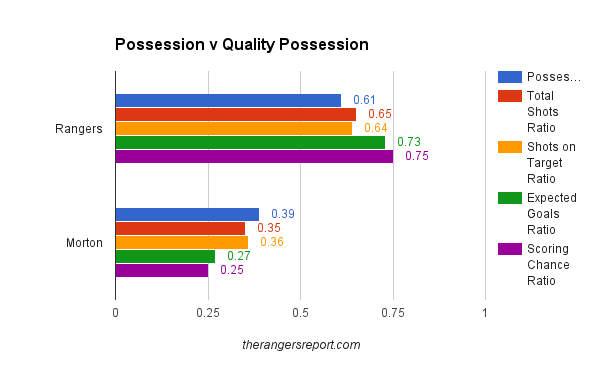 It wasn’t always scintillating, but Rangers did indeed manage to put in a real efficient performance on Monday night. Rangers put steady pressure on Morton’s defence & that is evident in an Expected Goals total that is on par with some of their best outings of the season. Morton did manage to block six of Rangers’ shots, which translates to a 2.1 Fenwick adjusted xG total. Either way Rangers actual output of two goals was a just reward for a well played match on the road, especially if you consider the fact that Morton had been outshot 16-5 at the time of Andy Halliday’s bizarre dismissal. The management team’s enhanced focus on working on ways to break down the defence in the final third is really beginning to pay-off. Of Rangers 20 shots, 75% came from within the penalty area & 45% came from a High Danger area. Compare that to Morton, who actually outshot Rangers from outside the penalty box. 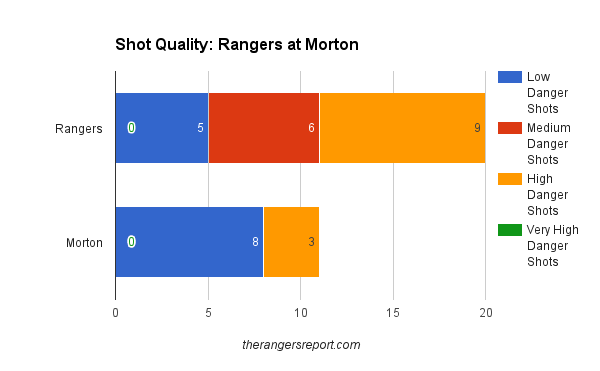 Morton’s reliance on long distance efforts translated to only 27% of their shots coming from within the penalty box. When Rangers went a man down they effectively kept Morton’s attempts at a distance, with only one of their six shots came from inside the box after Halliday’s saw red. It was interesting amusing to hear Stuart McCall downplay the importance of Rangers’ dominance in possession during the match commentary, while explaining how it was actually an evenly played match. Yes, Morton deserved credit for not losing 4-0 – but it would be a bit of an exaggeration to suggest that Morton & Rangers were evenly matched. Rangers ability to create quality shots is highlighted here by their Shots on Target Ratio & their Scoring Chance ratio. Morton’s reliance on long range efforts really limited their threat to beat Wes Foderingham (who did look shaky at times). Furthermore, Rangers had taken 76% of the shots upon Halliday’s damning shake of the fist. When a team generates 73% of the Expected Goals & 75% of the scoring chances – then possession really does matter. 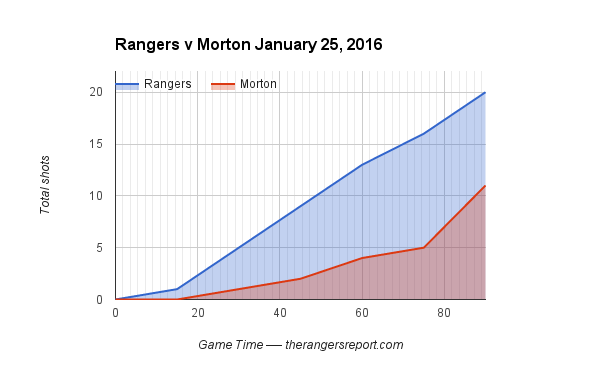 After a slow start, Rangers put a steady barrage of shots on Morton’s goal. In the first 25 minutes, they only had two shots on goal – meaning the other 18 came in the final 75 minutes. That translates to a shot every 4.2 minutes. Meanwhile, Morton was completely stifled until Halliday’s red card. They had five shots in the first 71 minutes & then only managed one in the next 13 minutes following the referee’s lapse of sanity. The final 5+ minutes saw Morton get five shots, which represented 45% of their total. Kenny Miller has had a real knack at creating quality scoring opportunities this season. After a snakebitten couple of months in the autumn weeks, the veteran has been on scintillating form as the weather has gotten more frigid. Miller had three shots & all three were a quality scoring chance against Morton. In addition to his opener, he also got the assist on Barrie’s McKay’s strike. Barrie McKay’s continues to add to his resume, as he once again played a vital role in a Rangers victory. Besides his goal & three shots, he led the team with seven controlled entries into the final third. Those Controlled Zone Entries resulted in Rangers getting a goal & four shots. Although he was only on the pitch for half an hour, Dean Shiels managed to a have a real impact on the game. His five controlled entries into the final third was only two behind McKay & they resulted in a Rangers shot 40% of the time. Additionally, he played a critical role in setting up Barry McKay’s goal & added two Defensive Zone Exits – in a real box-to-box effort. 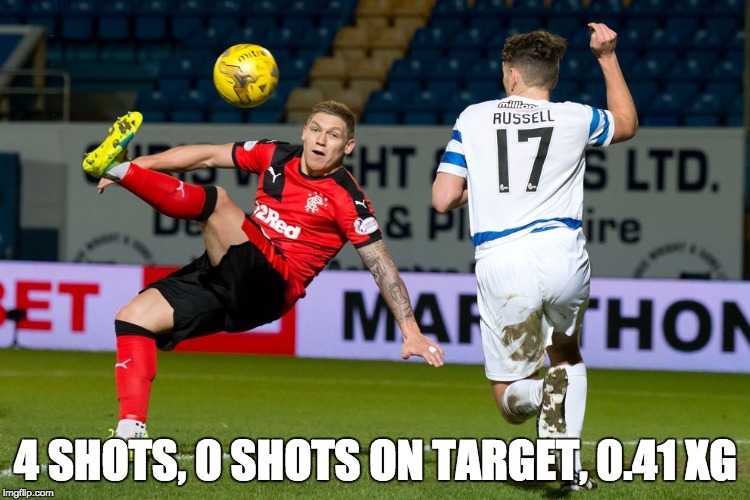 Even though he had his chances, Martyn Waghorn had an uncharacteristically quiet match on Monday night – getting none of his four shots on target. These nights are going to happen & luckily the team proved that it can rely on getting shots up & down the line-up sheet. Eight Rangers players had at least two shots with only the two center-halves & two of the second half subs failing to register a single shot.